‘How hungry are you’ was Ian’s question as we stepped outside our office onto Dyer Street. What a question! There is still a difference between hunger and what I think I should eat at the moment, so I replied ‘oh not very, anything with lettuce leaves will be perfect’ and with that we stopped outside the Mosaic Café, a huge distance of 1 minute from our front door, checked out the menu and popped inside taking the last available table. The Café is deceptively spacious inside and seems to be a popular eatrie, there were a few gatherings of mums with small children and fortunately enough high chairs to cater for this, along with some diners who look like they had enjoyed some serious shopping that morning. With something for everyone on the menu from sandwiches and jacket potatoes to toad in the hole, I spotted a salad and avoided reading the rest of the menu, Ian chose a very satisfying meal of gammon, egg and chips. The portions of food on the plates coming out of the kitchen started to concern me as they were certainly very generous and that was definitely still the case when our food arrived. Ian tucked into his plateful with gusto and whilst my ploughmans was very tasty my eyeline was zoned in on the giant sized scones and lemon meringue pie that was displayed directly opposite our table along with an incredible selection of other cakes. 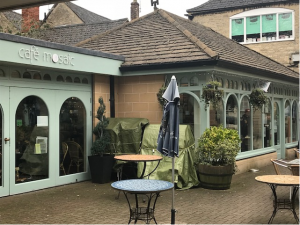 I know that my salad days are gone along with my waistline, I only have eyes for the pie and next time I am in Cirencester will be diving into this café for a large slice!